# Object detection system overview. 4.	classifies each region using class-specific linear SVMs. 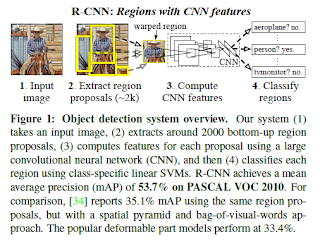 * R-CNN achieves a mean average precision (mAP) of 53.7% on PASCAL VOC 2010. * On the 200-class ILSVRC2013 detection dataset, R-CNN’s mAP is 31.4%, a large improvement over OverFeat , which had the previous best result at 24.3%. *  One approach frames localization as a regression problem. they report a mAP of 30.5% on VOC 2007 compared to the 58.5% achieved by our method. * An alternative is to build a sliding-window detector. considered adopting a sliding-window approach increases the number of convolutional layers to 5, have very large receptive fields (195 x 195 pixels) and strides (32x32 pixels) in the input image, which makes precise localization within the sliding-window paradigm. * fine-tuning for detection improves mAP performance by 8 percentage points. * The first generates category-independent region proposals. These proposals define the set of candidate detections available to our detector. *  The second module is a large convolutional neural network that extracts a fixed-length feature vector from each region. * The third module is a set of class specific linear SVMs. * which detect mitotic cells by applying a CNN to regularly-spaced square crops. * use selective search method in fast mode (Capture All Scales, Diversification, Fast to Compute). * Features are computed by forward propagating a mean-subtracted 227x227 RGB image through five convolutional layers and two fully connected layers. * At test time, run selective search on the test image to extract around 2000 region proposals (we use selective search’s “fast mode” in all experiments). *  warp each proposal and forward propagate it through the CNN in order to compute features. Then, for each class, we score each extracted feature vector using the SVM trained for that class. * Given all scored regions in an image, we apply a greedy non-maximum suppression (for each class independently) that rejects a region if it has an intersection-over union (IoU) overlap with a higher scoring selected region larger than a learned threshold. * use the stochastic gradient descent (SGD) training of the CNN parameters using only warped region proposals with  learning rate of 0.001. *   use intersection-over union (IoU) overlap threshold method  to label a region with The overlap threshold of 0.3. * Once features are extracted and training labels are applied, we optimize one linear SVM per class. * adopt the standard hard negative mining method to fit large training data in memory. * compared against four strong baselines including SegDPM, DPM, UVA, Regionlets. * which is the max pooled output of the network’s fifth and final convolutional layer. * CNN’s parameters  fine-tuned on PASCAL. * 16-layer deep network, consisting of 13 layers of 3 _ 3 convolution kernels, with five max pooling layers interspersed, and topped with three fully-connected layers. We refer to this network as “O-Net” for OxfordNet and the baseline as “T-Net” for TorontoNet. * drawback in terms of compute time, with in terms of compute time, with than T-Net. #### CNN features for segmentation. * full R-CNN: The first strategy (full) ignores the re region’s shape and computes CNN features directly on the warped window. Two regions might have very similar bounding boxes while having very little overlap. * fg R-CNN: the second strategy (fg) computes CNN features only on a region’s foreground mask. We replace the background with the mean input so that background regions are zero after mean subtraction.